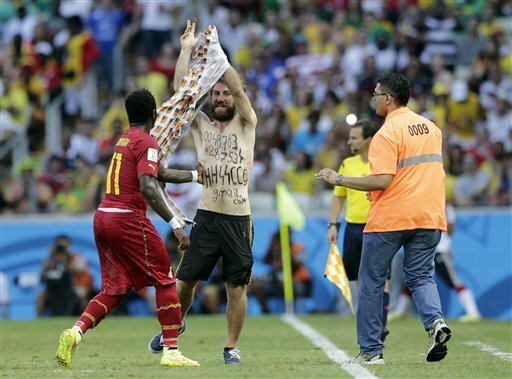 Racist incidents at World Cup games were many. FIFA's discrimination task force leader called for better prevention of "mocking and insulting" incidents at World Cup stadiums. FIFA vice president Jeffrey Webb tells The Associated Press "we have to be more vigilant and more aggressive monitoring this situation." 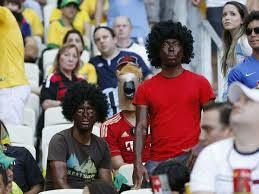 Germany fans were photographed wearing black face make-up at a match against Ghana. Fans' monitoring group Fare questioned how the fans entered the stadium with blackened fans, and reported similar incidents involving France and Belgium supporters. Webb says such acts were "making a mockery and disrespecting another human being." With local organizers having extensive stadium security rules, Webb says "it is unfortunate we (FIFA) have put ourselves in a position to be criticized." FIFA's disciplinary committee is deciding whether to proceed with action against national federations, which are responsible for fans' behavior. But Germany has not been the only country plagued by racist incidents at their soccer games. France, the United Kingdom, Brazil, Greece and fans all across Europe have acted out during the games and on the streets. Soccer players of color have been subjected to racial slurs, which has included being called a "monkey" along with monkey gestures and sounds. Players have been subjected to things being thrown on the field at them, particularly bananas. Even fans have rushed onto the field, with their bodies painted with racist graffiti. So just as the game has been plagued by racists incidents during the regular and playoff games, it is little wonder that the racism showed up at the World Cup games. Despite fines, suspensions, stadium closures forfeiture of games, racist behavior on the part of fans continued. There were even instance of racist comments by coaches and others in authority.